If you're a tennis enthusiast then Hale Kamaole is the place for you! We have our own private tennis court, which is both full sized and entirely enclosed. At Hale Kamaole, you can practice your stroke, take a dip in the pool, and then check-in with our on-site activities and concierge desk for what to do next! Across the street, Kamaole III Beach has playful waves, great snorkeling, and stand-up paddling. The Kihei boat ramp, which is the takeoff spot for many boat and rafting tours, is just a few minutes down the road. Hale Kamaole has many visitors returning year after year for their vacation rental needs. 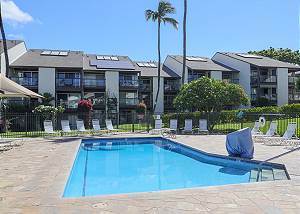 With amenities like these, Hale Kamaole condo resort is one of the hottest vacation properties in Kihei. Book quickly for your best Hawaiian vacation! We have both one bedroom and two bedroom spacious condos that can accommodate up to 6 people. Some of the condos for rent also have additional loft areas, which provide more living space. Each condo is individually owned, therefore, each has their own unique furnishings. However, well-equipped kitchens and spacious layouts are standard throughout. 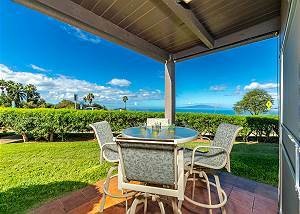 Beautiful landscaping and well-maintained property features, such as the on-site barbecue facilities and pools, welcome you to the magic of Maui. Let yourself get lost in 'vacation mode' as you rest and relax at your well appointed Maui condo!